Welcome to CompletelyNovel – the friendly publishing platform dedicated to helping indie authors create, publish and sell beautiful print books. As well as offering authors 100% royalty rates and an innovate route to publication, we have oodles of free advice and a friendly team on hand when you need us. On this page, you can find out more about what CompletelyNovel can do for you. Use these quick links to explore CompletelyNovel, or read more about each of them, below. We’ve pioneered low-cost, subscription-based publishing plans, so you don’t need any upfront fees to start publishing, and you can keep 100% of your book royalties. Use our online tools to create beautiful print books: simply upload your manuscript, create a cover and set your price, and your book will be published with an ISBN and available for sale worldwide on sites such as Amazon. You can learn about publishing on CompletelyNovel by clicking the ‘Publish’ tab on the top bar. We’ve put together a comprehensive guide to the publishing industry in our advice centre, covering everything from a guide to literary agents and how to go about designing a book cover, to tips for marketing your book – and everything in between! It’s our view that informed authors create brilliant books, so we offer all this advice for free and keep it up-to-date as the industry changes. Find our advice centre in the ‘Advice’ tab in the top bar. Looking for a great new read? Our online book preview allows you to read part of any book published with CompletelyNovel. You can also buy CompletelyNovel books directly from us. Add books to your profile, review the books you love, and chat with other readers – all in our Readers’ Cafe. Discover a great new read via the ‘Read’ tab in the top bar. Chat about books and reading with other readers, find out about new titles on CompletelyNovel, or ask us any questions you have about using the site – all in the discussions hub. You’ll also find some of friendliest writers online, ready to answer any questions you may have about publishing. Enter the discussions hub at any time, by clicking the ‘Ask a Question’ tab on the left hand side of your screen. Keep up to date with the latest news and advice from CompletelyNovel and from the publishing industry, in the CompletelyNovel news room. Here, you’ll find details of exclusive author opportunities, tips from industry experts, upcoming events and competitions and the latest news from CompletelyNovel. Keep up to date by clicking the ‘News’ link at the top of the page. We offer expert services for writers who need extra help and support. One-to-One Publishing Consultations, just £35/$55. Professional Typesetting, from only £35/$55. Marketing help, from just £35/$55. Cover design, from just £99/$149. The best way to learn about publishing is to get stuck in. So – choose one of our publishing plans and start creating! Remember – you can leave at any time and keep all copyright to your work. We’re very proud to boast an eclectic mix of authors writing across a whole spectrum of fiction and non-fiction. They are also some of the nicest people around, and have kindly let us know what they think of publishing with CompletelyNovel. Check out a few of our favourite author testimonials here. We use technology to make things simpler: We provide simple tools so you can create professional books and distribute them all over the world within days. We believe that long-term contracts and large upfront fees are rubbish: There are no long-term lock-ins when you’re using CompletelyNovel: if you sign up for a service, you can cancel at any time. Our publishing subscriptions: We’ve pioneered a different way to self-publish, using low-cost subscriptions that allow authors to keep 100% of book royalties. Personal customer service: If you’ve got a problem, we’ll solve it. In fact we’ll solve it and then some. 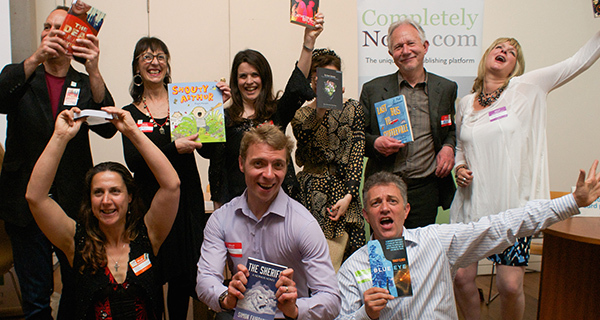 We actively hunt for opportunities for our authors: Behind the scenes, we meet with partners, literary agents and traditional publishers, and organise unique opportunities and events for CompletelyNovel authors. CompletelyNovel is a Partner Member of the Alliance of Independent Authors, and has been vetted by ALLi’s Watchdog Desk. CompletelyNovel opened its doors in February 2008. We are based in sunny Brighton in the UK, but help authors from all over the world publish their books. You can chat to us face-to-face at writing events, book in a Skype consultation, or just drop us an email – we want to get to know you. Jessica manages CompletelyNovel customer care, creates amazing illustrations and writes childrens books. Oli designs and builds things like CompletelyNovel. 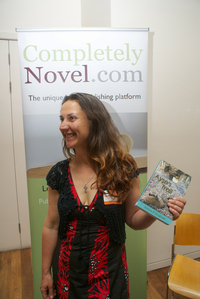 Anna manages CompletelyNovel and has been behind a number of other book publishing projects. She loves books and flapjack in equal measure.